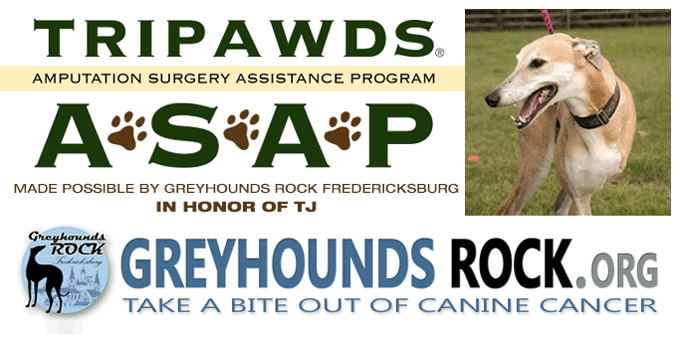 Thanks to a generous contribution from Greyhounds Rock Fredericksburg, the Tripawds ASAP fund will be helping more dogs diagnosed with osteosarcoma and other limb cancers get the life saving surgeries they need! The Tripawds Amputation Surgery Assistance Program is a veterinary financial aid fund created to help those in need pay for limb amputations of dogs and cats diagnosed with cancer, or who may have lost a leg for other reasons. Funds donated by Greyhounds Rock will be dedicated to providing assistance for those people facing a life threatening limb cancer diagnosis for their dog or cat. The 2017 surgery assistance program will now be known as the Tripawds ASAP Fund in Honor of TJ. Tripawds and Greyhounds Rock Fredericksburg have a long history of working together to raise awareness—and funds—to take a bite out of canine cancer. Greyhounds Rock representative Kim Fraser first joined the Tripawds community in 2011. Her dog TJ was diagnosed with bone cancer resulting in amputation in July, 2010. Learn all about TJ here and read on for a statement from Kim. Each of us knows someone who has lost a dog to cancer. Cancer is the leading cause of death for our canine companions. According to the Morris Foundation, up to 50% of all canines will die from cancer. Greyhounds Rock Fredericksburg, a 501c(3) non-profit fund-raising charity, was created to raise awareness and funds to support canine cancer research, to honor the dogs that are or have been affected by this disease, and to offer encouragement and education to the people who love them. Greyhounds Rock cannot succeed without donations or sponsors. 100% of every dollar raised by Greyhounds Rock goes to canine cancer treatment, research and support. Greyhound Rock team members donate their time and resources to ensure every cent goes to help the dogs. Every donation to our events, or sponsorship from individuals, groups, and merchants, helps achieve the goal…effective treatment, and an eventual cure, for canine cancer. Each year we donate the previous year’s fund raising amount to like-minded entities such as the Tripawds Foundation to provide aid to as many dogs as possible. Royal was the first ASAP grant recipient in January, 2017. Applications are now being accepted for the February grant. If your dog or cat recently had an amputation, or you have surgery scheduled, please review all ASAP requirements to see if you qualify. The application deadline is the 15th of each month. 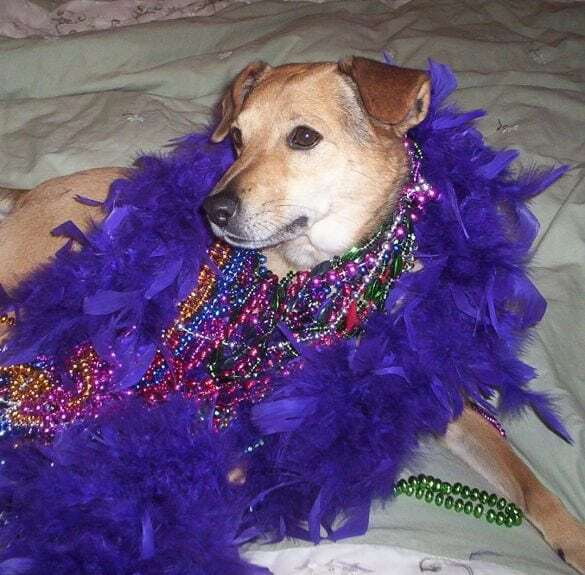 Support Tripawds to Keep ASAP Fund Going! Way to go, Greyhounds Rock! Amazing! Thank you, Greyhounds Rock! Yay and a HUGE thank you to Greyhounds Rock. Tj was an awesome dog and Kim wrote a book about him as well and the Therapy work he did.